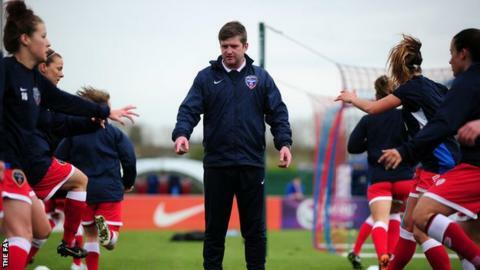 Bristol Academy boss Dave Edmondson admits he will struggle to lift morale until their miserable losing run ends. The Vixens have lost all five games to date this term, been eliminated from two competitions, conceded 20 goals and netted just once from the penalty spot. Wednesday's defeat by Arsenal left them bottom of Women's Super League One. "It will continue to be tough until we get our first goal from open play, our first point and the first three points for a win," Edmondson told BBC Sport. "Once that happens you will see a diffident side with a bit more confidence." Bristol Academy next face Sunderland, who last season became the first side to be promoted from WSL 2 to the top flight, and together they are regarded as favourites for relegation. Edmondson admitted the game was a "six-pointer", but said the fight for survival will be more complex. "It is not a two-horse race to win the title and it not a two-horse race for finishing bottom," he added. "We have to pick up points ever time we play and that starts with Sunderland on Saturday."